Sleep apnea is a concern for those with PWS. In fact, of all participants of the Global PWS Registry, about 70% of those who have had a sleep test have been diagnosed with some form of sleep apnea. Sleep apnea is characterized by disrupted breathing during sleep, usually long pauses between breaths or shallow breaths. It is associated with increased risk for mood and memory problems, high blood pressure, stroke, heart failure, and diabetes. A sleep study is recommended for all infants with PWS as highlighted in a previous blog post on this topic which can be found here. There are two types of sleep apnea, obstructive and central. Obstructive sleep apnea is much more common and is due to a physical blockage or collapse of the airway. Common causes are enlarged tonsils, or being overweight. In PWS, hypotonia (low muscle tone) may also contribute to obstructive sleep apena, even in individuals whose weight is well controlled. Central sleep apnea is less common in the general population, and results when the brain itself doesn't send the right signals to stimulate breathing. Central sleep apnea appears to be common in infants with PWS, occurs with less frequency older children with PWS, and can be improved with supplemental oxygen during sleep (see previous blog link, above). In addition to being a concern for PWS, obstructive sleep apnea affects an estimated 18 million adults in the United States alone. The current standard therapy for obstructive sleep apnea is continuous positive airway pressure (CPAP). However, many patients don't respond to CPAP, and others don't use it as prescribed because of discomfort. Within the Global PWS Registry, 50% of those prescribed CPAP use it less than prescribed, or not at all. However, recent work out of the University of Pennsylvania is exploring a new therapy for the treatment of obstructive sleep apnea (OSA). In a clinical trial with 20 patients, researchers tested a device that stimulates the nerve that controls tongue movement when there is a pause in breathing. The device is implanted in the chest, and can be turned on and off by the patient when going to sleep and waking up. The results show an 84% reduction in breathing pauses and an 11% increase in blood oxygen levels, suggesting that hypoglossal nerve stimulation (HGNS) may be an alternative for those who can't tolerate CPAP. The PWS community is still working to learn more about the prevalence and severity of sleep apnea among those with PWS. We also need to gain a better understanding of treatments in use and their effectiveness to help direct research, therapies, and standards of care in our community. 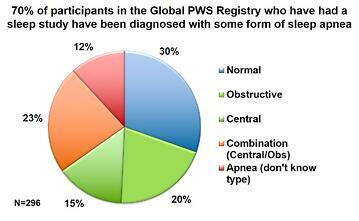 Please add your experience on PWS and sleep to the Global PWS Registry today!